Ultrashort bond prices have been dropping precipitously, sometimes dramatically plunging a plural number of basis points in a single day!! Risk finally showing up? Trading halt on the way? Okay, that's tongue in cheek, but seriously, what's behind the recent (past month or so) drop in ultrashort bond prices (not talking about ex-div days obviously)? Examples FLOT and FLRN especially, but also NEAR, MINT, GSY (while ICSH is not affected). I normally wouldn't use such things, but I went for a brokerage bonus and had to park part of the balance in these that otherwise would have sat in VMMXX. Yes, I know the stakes are low, but it's theoretically interesting. I really don't understand what these things are. Maybe because short rates have been rising? I don't think that's it. Timeline is wrong. These supposedly have "ultrashort" duration, though there seems to be some trick to that that I don't understand. It's (mostly) something else, but I don't know what. I remember the Fidelity Ultrashort Bond Fund. I don't know what's in these kinds of funds, but apparently it isn't what people expected... and apparently it's really important to know. The Fidelity Ultrashort Bond Fund doesn't exist any more. Of course. (@nisiprius) "Freefall" was hyperbole (and playing on another long thread that used that word). Nothing like that Fidelity Ultrashort Bond Fund you graphed. But some of the funds I mentioned have shown a drop that is noteable relative to usual behavior, and not for an obvious reason (ex-div day, or generally rising rates). These things supposedly have durations a fraction of a year, while holding a lot of bonds with maturities of a few to several years. I absolutely do not understand how they do this. I wonder if whatever "trick" they use is the kind of thing that works almost always, except when it doesn't. And when it doesn't work, how badly does it not work? Re "timeline" I was thinking Fed rates have been rising 2-3 years, whereas the drop I'm talking about here is just the last month or so. You're explanation re LIBOR sounds very plausible, though I don't know what it is so I'll look it up. Also "changes don't always show up until floor is breached" rings true to me. So, all I learn from this is that I have no idea what financial engineering magic is involved in getting an 0.15-year duration out of two-year bonds. I think anyone who buys one of these things needs to figure that out, though. Very likely Fidelity was using the wrong spells in 2008, and these funds are doing the same things but doing them right... or something. The prospectus is clear as mud. "This mysterious fund simply reflects a mysterious underlying index." The Fund seeks to track the investment results of the Bloomberg Barclays US Floating Rate Note < 5 Years Index (the “Underlying Index”), which measures the performance of U.S. dollar-denominated, investment-grade (as determined by Bloomberg Index Services Limited (the “Index Provider” or “Bloomberg”)) floating rate notes. Securities in the Underlying Index have a remaining maturity of greater than or equal to one month and less than five years, and have $300 million or more of outstanding face value. Now, why would securities with maturities of 1 month to five years end up with a duration of 0.15 years? A type of bond fund that invests only in fixed-income instruments with very short-term maturities. An ultra-short bond fund will ideally invest in instruments with maturities around one year. Well, this fund isn't doing that. Less than 1/6th of the fund's holdings have maturities of a year or less, and that "up to five years" isn't some kind of weaseling, 22.35% of the holdings are 3-5 years' maturity. Could they include a bunch of instruments that are the "opposite side" so to speak of the bonds that get stripped to create zero-coupon securities? (@nisiprius) I agree. VUBFX looks straightforward. But I do not understand these ultrashort bond ETFs, especially the floating rate ones. I do not understand the duration-maturity incongruity. Duration measures the price sensitivity of a security to interest rate changes. The higher the duration, the more sensitive it is. For a floating rate security, if it's interest payment rises in locked step to interest rate, then technically it's sensitivity is very low or zero. This is despite the fact that it's maturity is non-zero. So an "ultrashort bond fund" made of floating rate bonds and one made of fixed rate bonds are completely different animals? Investors who maintain highly bond-centric portfolios (80% or higher bonds). Investors who are averse to pure interest rate risk. Investors who are not averse to credit risk. Vanguard research (August 2011) argues that most bond-centric investors are highly risk averse, and that exchanging interest rate risk for higher floating rate note credit risk falls outside these investors' risk tolerance. These investors would likely be better served by limiting portfolio volatility by holding short term treasury or short term investment grade bond funds. We suggest that investors may be best served viewing these funds in a light similar to that of high-yield fixed income funds, and not as an alternative to high-credit-quality bond holdings. Since I personally am not that highly bond-centric, am only mildly averse to interest rate risk, and am distinctly averse to credit risk, I conclude that floating rate bonds are not at all relevant to me and there's no reason for me to learn anything more about them. Maybe. Duration measures sensitivity to interest rate changes. Floating rate bonds can change the interest rate they pay over their lifetime. The prices of floating rate bonds don't need to change in response to general changes in interest rates because the interest rate the bond pays changes instead. As you know, the prices of fixed rate bonds change when interest rates change. Either fixed or floating are probably suited to someone's investing needs, but it's not immediately clear---at least to me---that ultrashort duration funds made from fixed or floating bonds have to be equivalent in all circumstances. Yet another example of why we can't trust the name or category of a fund to tell us what's in the fund or how we can expect it to respond to various market conditions. That ICSH looks pretty sweet. High credit quality, low duration, good yield, low expenses, tradeable, non-crashy (so far). Not really. It's just that floating-rate bonds have duration much lower than maturity. Maturity is just the time at which a floating-rate bond pays you back the principal. The interest payments are floating, resetting regularly to some short-term rate benchmark (like a LIBOR or Federal funds rate) + some spread, so term risk exposure and duration are low. After all, changes in rates shouldn't really change the price of the floating-rate bond. Do you really care if you have a floater at a rate of LIBOR + 50 bp issued 2 years ago and maturing in 2 years, vs. a floater at a rate of LIBOR + 50 bp from the same issuer maturing in 2 years? I mean, not really, I would hope. edit: Now, keep in mind that this means an adjustment based on safe rates changing. If credit spreads widen, this can be bad news for the life of the bond (and the longer maturity could hurt). For example if a floating-rate bond is FFR + 40 bp, matures in 3 years, and credit spreads widen and similar bonds should now be FFR + 80 bp, you're losing out for a longer period of time with the floating-rate bond rather than let's say a bond with similar term risk and credit risk that matures in 3 months. A number of ultrashort bond funds use a combination of fixed-rate and floating-rate instruments. The latter market is not huge, and investment-grade floating-rate bonds are mostly issued by banks, so I'd rather not have something that's required to be purely floaters out of considerations of diversification. In many contexts, "floating-rate bonds" are meant for whatever reason to mean bank loans (aka senior loans aka leveraged loans), many of which are sub-investment grade. These are floating rate. 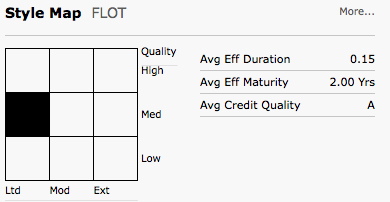 These are also not what's in the floating-rate bond ETFs mentioned in the OP such as FLOT and FLRN. Floating rate bonds are usually issued by companies that are below investment grade status. The average credit quality of floating rate bond funds is BB - B.
I suppose there are a number of mutual funds covering that area. However, all of the ETFs mentioned by the OP (FLOT, FLRN, NEAR, MINT, GSY, ICSH) are 100% or substantially all in investment-grade securities. Some of the latter include things like CDs, commercial paper, even some money market stuff, in addition to just regular fixed-rate bonds about to mature, in addition to sometimes having some investment-grade floating-rate bonds. So much of the discussion may not be that relevant to what the OP was trying to discuss. For those with say Merrill Edge (no good money market, probably free trades), it's an option. An issue is lower liquidity than many of the other funds in the space, though it has higher credit quality, lower duration, and lower expenses than most competitors. Last edited by lack_ey on Sat Dec 01, 2018 9:35 am, edited 1 time in total. As far as interest rate sensitivity goes, there's no difference. But a true ultra short term bond is inherently liquid, since you can just wait for it to mature. With a long term bond you have to find a willing buyer. Floating rate bonds are also subject to spread duration. Basically, spread duration approximately measures the change in a floating rate bond's price with changes in credit spreads. The price movement will be approximated by multiplying the change in the yield spread times the spread duration. Thus if a floating rate bond has a spread duration of 2.0 and the credit spread widens by 100 basis points, the bond's price will decline by approximately 200 basis points. Yep, I like it quite a bit as well. The main thing to watch out is that it's not commission free anywhere, so you if you're using it as a cash/savings account substitute, something like Fidelity's FCONX (Conservative Income fund) or FUMBX (the short-term treasury fund) is a good place to store the regular liquidity needs. I happened across another ultrashort fund the other day, CLTL INVESCO TREASURY COLLATERAL ETF, which holds T-bills. The ER is low, 0.08%. I don't think it's ever been discussed on this site. It seems to have been created to act as collateral for Invesco's CCF funds, though I'm not sure why Invesco would want to do it that way. Yes. If credit spreads widen the floating rate instrument with say a 5-year term has to discount that in over the 5-year period resulting in a significantly larger principal drop than for an ultrashort term instrument that will be cashed out in a year or less. The short duration of the floating rate instrument applies to changes to the interest rate to which the instrument is pegged, but not to changes in credit spreads. Last edited by Northern Flicker on Sat Dec 01, 2018 5:08 pm, edited 1 time in total. I am confused... The following is a tell tale chart, ytd, including dividends of NEAR, MINT, and ICSH. You can only see one because the lines are literally on top of each other. Can you please point to the freefall? What am I missing? It's hyperbole, an attempt at light humor, but still wanting to seriously discuss the phenomenon. I'm learning something. I sometimes use MINT or JPST in the Merrill Edge tax-deferred accounts to hold cash. In the past two weeks or so, I did notice that the steady NAV increases stopped for MINT. I intend to switch to SHV or BIL in the future instead. Your point and graph are totally valid. These are low risk stable investments (though not that Fidelity one nisiprius posted earlier). BUT they're not quite as safe and stable as me and others may have thought. We've seen pretty stable times, not huge jumps in rates or credit spreads as of late. We haven't really seen the risk show up, so to speak (as let's say a 5 percentile or worse outcome). It can get a lot bumpier. Defaults and downgrades activity could be much more prevalent at times, and over a given period credit spreads can widen (and hurt performance over that period, if rapid enough). But over a normal period like this, investors had a pretty decent time, I would say, for what it does and the risk. Hopefully it's understood that there's some real risk here, even in the investment-grade space. That's what comes with the higher yield. Floating Rate Notes have very short duration because they are equivalent to money market instruments. I think floating rate funds tend to have lower rated bonds in them, unlike money markets. But ultrashort bond funds can be money market-ish. and these figures are in line with category average, according to M*. On the other hand their ultrashort fund (TRBUX) has less than 7% rated BB or unrated and this is also similar to category average, so it is mostly investment grade. This discussion seems to be mixing up these two much different type of funds. One is like a short duration, high yield bond fund, the other is like a long duration money market-like fund or just a very short term bond fund (particularly in the case of the Vanguard version, VUSFX, which has 85% of holdings rated A or above). To add onto the point about credit spreads...that is true for a given bond issuer as well as which issuers participate in the market. Also, the widening of spreads, of course, reflects worsening credit. Specifically regarding the floating rate issues that use LIBOR in determining the rate, do you think the recent changes in LIBOR is affected by worsening credit? the fed actions? Both? something else? The last 3 months the 3 month LIBOR has changed in what I would say is an "unusual" amount (admittedly, I'm not an expert & could be proven wrong of that characterization...). Maybe a canary that can't sing for the coughing? Seems to me the freefall is not everywhere. I'm curious. 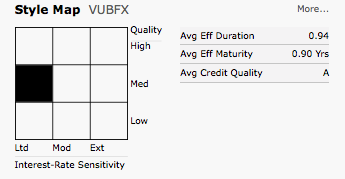 How does VUBFX have duration longer than maturity? I think it's a derivative thingy. But I don't really care about a few days difference. There was a flurry of creating new ultrashort bond funds in response to money-market interest rates being at or within a basis point or two of zero for a long time. The idea was to have a very short duration, less than one, and take credit risk to actually earn a little bit of interest. The short maturities mean that the credit risk is primarily limited to actual defaults because credit spreads rising and/or liquidity falling for a bond can be dealt with easily by holding the bond to maturity for the short remaining period, so that the effect on NAV of interest rates or credit spreads increasing would be well controlled but not non-existent. If you think about floating rate instruments from the perspective of the issuer, it clarifies that floating rate credit is unlikely to be of high credit quality. The corporate issuer would prefer to issue fixed rate bonds to lock in the low prevailing interest rates. Floating rate instruments would only be issued by companies insufficiently creditworthy to issue fixed rate instruments at attractive rates. Floating rate credit also has more liquidity risk than duration-matched fixed-term credit because the longer maturities provide less liquidity from bonds maturing. Not a fan of click-bait titles. Maybe an admin would be willing to augment it. It is worth examining other asset classes and what may be behind unusually large drops relative to what's normal or expected for that asset class. Is it? How is such an "examination" "worth" it? And what exactly is "normal" or "expected", aside from the narrative fallacy such concepts are based on? I've learned something. Like the stuff they sell in Starbucks display cases, asset class pastries with opaque and complex filling disappoint when actually consumed. Ok, I didn't just learn this. I already knew it, simply based on history. My guess is that funds that saw a dramatic price drop in the recent past held a lot of GE bonds. There are a lot of them out there and they lost a great deal of value after GE's last report. Vanguard had a bunch of their "investment grade" bonds yielding around 7% on Friday, which tells you their price has tanked. They may be technically "investment grade" but they are trading like junk. As mentioned in the Bogleheads wiki article, the U.S. Treasury sells Treasury FRNs, more information available on TreasuryDirect. They have done so since 2014. The at-issue maturity is 2 years but the interest payments rise and fall based on the discount rate demanded by the market for the 13-week (3-month) bill. We see then that even absent the higher yields demanded as compensation for credit risk, which then pushes duration lower than maturity, it is still possible for maturity to be vastly different than duration. Vanguard's paper predates the existence of Treasury FRNs. If you want to be really technical about this, the Treasury FRNs are not "bonds" so their arguments are still correct even in a modern context, but can be misleading. FYI - It's very difficult to convey humor in this forum. I retitled the thread for clarity. The "normal" price graph of these ultrashort bond funds is a sawtooth shape as accrued dividends build up during the month, then drop back down on ex-div day (at least for funds where dividends accrue in the price, which is most of them). You have to subtract out this effect to see price movement from other causes. Anyway it appears that in a month, ETFs like FLOT and FLRN have dropped about 50bp, while ETFs like NEAR and MINT have dropped about 20bp. Obviously that's not volatile like stocks, but they're not cash either. b0B, I don't know whether floating rate bond funds are customarily included in lists of "ultrashort bond funds." Since you've been looking at them, from the thread title and initial reference to FLOT and FLRN, I gather that they are. If I've learned anything at all from this thread, it seems to me that one thing I've learned is that they shouldn't be. That is to say, funds with ultrashort durations because of ultrashort maturities are not at all the same thing as funds that hold bonds with 3-year maturities, and have ultrashort durations because the bonds themselves have floating rates and thus ultrashort durations. Now, can someone remind me just what it was that the Fidelity ultrashort bond fund was holding in 2008? Not exactly what you are looking for, but note that the Vanguard Treasury Money Market fund invests in Treasury Floating Rate Notes as well as Treasury Bills. This can be verified in the N-Q report. So why has the fund lost close to 10% of its value since July? Co-manager Andrew Dudley, an experienced hand who has a good record on other Fidelity bond funds going back to the 1990s, pleads "sizable exposure to subprime mortgage securities" and the fund's slowness to get out of them. Clearly, triple-A isn't what you think or Andy Dudley thinks it used to be. And maybe a simpler fund is better. The annual report needs 45 pages to list the investments in what was, as of July 31, a $1 billion fund (and is now down to $730 million). The holdings included credit-default swaps, total-return swaps, floating-rate mortgage securities, structured this and collateralized that. Some of these, such as credit-card receivables, are recognizable and relatively clear-cut. Most of them aren't. FLOT and FLRN price have dropped a full 1% in a month, which seems a lot for ultrashort bond funds (albeit the floating rate variety). But I just looked at M*, and it says that the Prem/Discount of these went from about zero to -67bp in one and -51bp in the other, so a gap has opened there. So the question is, which one is the real value, the price or the NAV? Obviously volatility in the 1.x% I have in ultrashort bonds is peanuts compared to the volatility in the >80% I have in stocks. But I'm totally used to how stocks have been behaving, whereas these ultrashort bonds seem weird to me and I really don't understand them (although the explanations here help).